Haven't tried it? Oh, you are missing out. 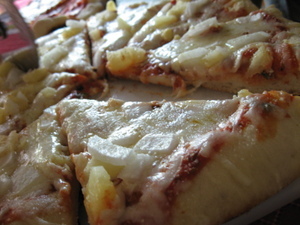 Way better than pizza on a stone, I swear. Amazing crust flavor. 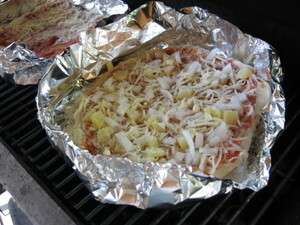 (One was 3/4 cheese 1/4 cheeseless, and the other was pineapple and onion - what we had around to use this time). And then, Aaron got hit in the head with an... owl pellet! Check him out! 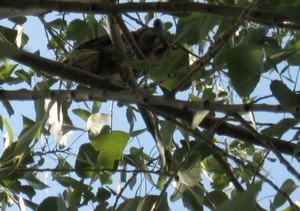 Right above us in our tree. Maybe he'll visit again sometime.